The past few years I have been becoming more aware of gaps in leadership by women, particularly in my industry (publishing) but also generally. When I graduated from college, almost twenty years ago, I did feel like the women's movement had done its part and now sexism was a thing of the past. However I made that assumption largely based on the presumption that things would continue on the same trajectory, and that by now there would be near-parity in business and politics between the genders. That has not panned out. I have become more interested in the feminist movement, after seeing how it has stalled and understanding that my generation needs to step up more. This book was fascinating. 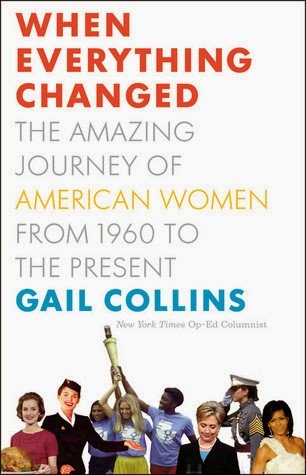 An entire history of the feminist movement (she does give a little history of the suffrage movement and the pre-1960s ERA), this book was so accessible as it was not written like a straightforward history book, but instead primarily consists of interviews with women who were themselves on the frontlines of the movement, from the big names like Gloria Steinem, to the secretaries, flight attendants, and activists who fought the good fight on a daily basis. The bulk of the book covers the 1960s, but it does also cover the 1970s (The Mary Tyler Moore Show) and the 1980s (power suits!) and even up through Hillary Clinton's rise in politics and Sarah Palin. Inspiring and at the same time chilling, to see how far we haven't come, and how there has even been some slide-back (college educated women dropping out of the workforce when they have children). I couldn't put it down and found every story riveting and the book makes me want to try harder for my fellow women. I think I also will be newly horrified when the next season of "Mad Men" starts back up, and also newly impressed with how women like Peggy and Joan pushed boundaries and smoothed the road for women like me to come. I didn't appreciate how hard it must have been, and how hard it still is, as evidenced by women such as Lilly Ledbetter today. This book is the perfect follow-up to Lean In.